Herbert Eugene Ives (July 21, 1882, Philadelphia, Pennsylvania ? November 13, 1953) was a scientist and engineer who headed the development of facsimile and television systems at AT&T in the first half of the twentieth century. Ives studied at the University of Pennsylvania and the Johns Hopkins University, where he graduated in 1908. He wrote a 1920 book on aerial photography, while an Army reserve officer, in the aviation section. Ives was also an avid coin collector, and was President of the American Numismatic Society. Like his father Frederic Eugene Ives, Herbert was an expert on color photography. In 1924, he transmitted and reconstructed the first color facsimile, using color separations. In 1927, he demonstrated 185-line long-distance television, transmitting the image of then-Secretary of Commerce Herbert Hoover from AT&T's experimental station 3XN in Whippany, New Jersey. In the 1940s, Ives expressed his vigorous opposition to Einstein's theory of relativity. Ives did not have an issue with the theory's predictions but with?as he formulated it in 1945? "The indeterminancies and impotences by which the "Restricted Theory of Relativity" has been widely publicized". Following the philosophy of Lorentz, he attempted to demonstrate the physical reality of relativistic effects by means of logical arguments and experiments. 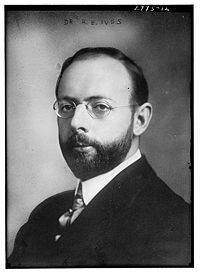 He is best known for the Ives?Stilwell experiment, which provided direct confirmation of special relativity's time dilation factor. "Ives' work in the basic optical field presents a rather curious anomaly, for although he considered that it disproved the special theory of relativity, the fact is that his experimental work offers one of the most valuable supports for this theory, and his numerous theoretical investigations are quite consistent with it? his deductions were in fact valid, but his conclusions were only superficially in contradiction with the relativity theory?their intricacy and formidable appearance were due entirely to Ives' insistence on maintaining an aether framework and mode of expression. I... was never able to convince him that since what he had was in fact indistinguishable in its predictions from the relativity theory within the domain of physics, it was in fact the same theory... some who have not penetrated to the essence of Ives' theoretical work have seized upon it as overthrowing the special theory of relativity, and have used it as an argument for a return to outmoded and invalid ways of thought." "Derivation of the Mass-Energy Relationship," Journal of the Optical Society of America, V42, pp. 540-543 (1952). "Note on 'Mass-Energy Relationship," Journal of the Optical Society of America, V43, p. 619 (1953).